This is a collection of images from my April wrap-up of supplementing my son's Montessori education at home. 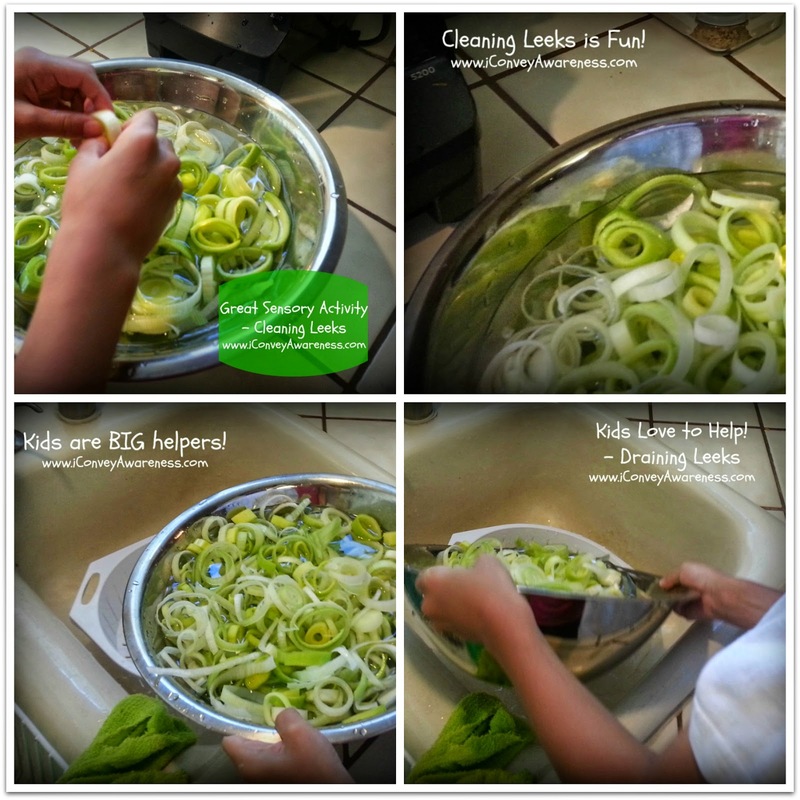 We use a lot of what I consider "unschooling" methods that are generally every day stuff we adults do like cooking and cleaning that kids can do too (and they're generally pretty excited about helping). So not only will you get some help, but they will get some sensory satisfaction out of it too! Plus it's a fun learning environment for them and you just might have a chef-in-the-making on your hands! One night for dinner I made roasted chicken with leeks and broccoli (see recipe here) and I asked my son to help me clean the leeks. I find this part to be therapeutic - cutting, cleaning and prepping the leeks. He enjoyed it immensely too. I cut them. He cleaned them. I've been working with my son to develop and strengthen his hands and fingers. He prefers to write with his left hand and this took some time to figure out. He uses both hands to play and eat. We've had this sensory box for several months and we take it out about once a week. He matches the pipes to the others and tightens them. There are also some screws with nuts to tighten. When they're all put together, he takes them apart and puts them away. It's a great way to increase dexterity. His hands are getting stronger. As his fingers get stronger he'll be able to write better and for longer periods of time without tiring easily. This activity compliments the one above because it helps strengthen the wrists. Using blue painter's tape, my son made a rectangle which is the area that he worked in. You can use any objects to sweep. I went with paper clips. Other ideas include: confetti or cereal. Since this was our first time doing this activity, I used the paper clips so that he could immediately see his efforts. After creating the rectangle, he poured the paper clips into it then swept them up and poured them back into the storage container. We repeated this exercise on his right hand then switched to his left. He was more efficient with his right hand. We will try one of the other objects next time. 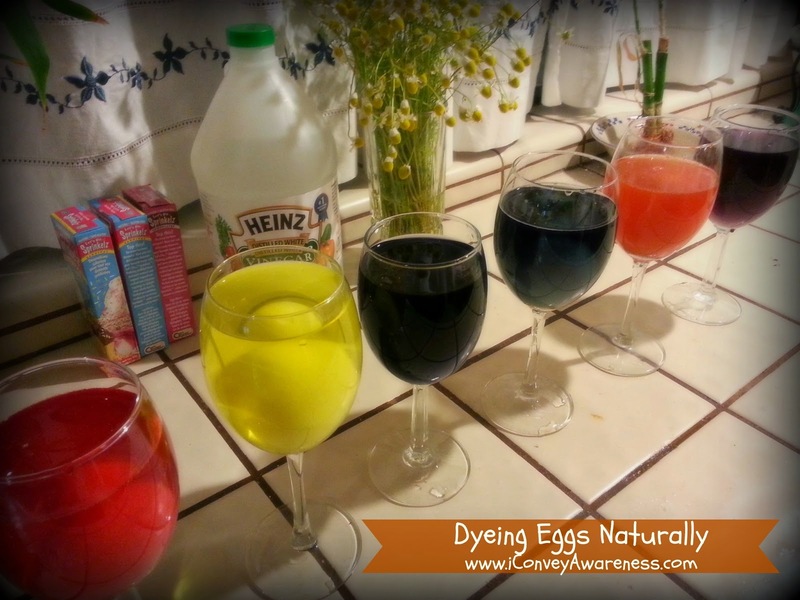 This Easter my son asked if we could dye eggs naturally. In year's past we just used the plastic eggs and filled them with trinkets. 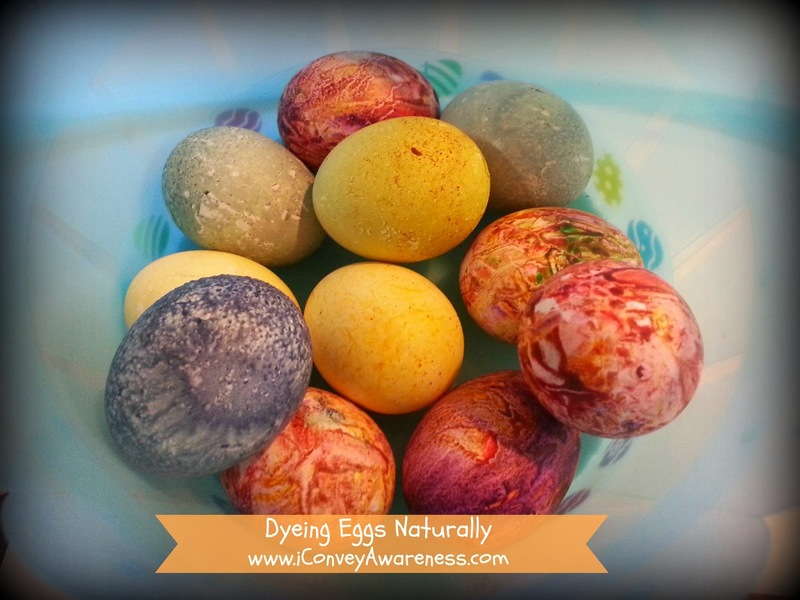 My son is five and he understands the negative effects of artificial dyes (more on this here) and like me he believes that artificial dyes are best used for crafts. After hard boiling a dozen eggs and cooling half the batch, we used Maggie's Naturals dyes (like this), turmeric and cayenne pepper. I used my wine glasses because they were the best fit for each of the eggs. We didn't measure but probably used 10 drops of the natural food dye to start, 1 tbs of white distilled vinegar and filled the rest with water. After about a half hour, we added more drops to the red, yellow, and orange (probably another 10 drops). Then about at the one hour mark we used cayenne pepper with the red dye and turmeric with the orange dye. The eggs soaked for about 2 hours. The other half of the batch, we used crayons to melt over the hot eggs. We used the egg carton so that we wouldn't burn our fingers (or least try not to). We had one small burn on a pinky but was resolved, or shall I say, forgotten about while we had fun coloring the eggs. These eggs came out really pretty. 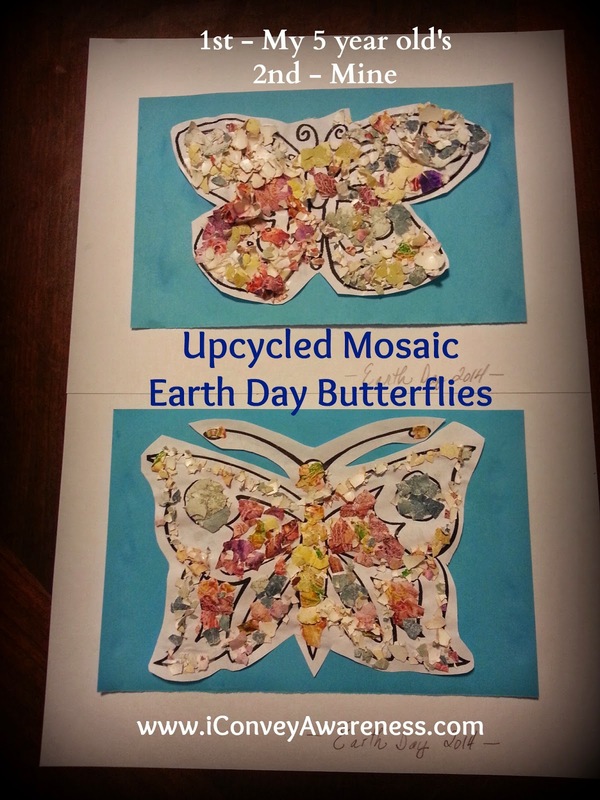 On the Tuesday following Easter was Earth Day and we decided to 'upcycle' our egg shells to make a Mosaic craft. We crushed the eggs and separated them by color then using them as 'broken glass' we glued them to pictures of free printable butterflies. This was a great way to show how easy it is to reuse. I have read that egg shells and used coffee grounds can help with maintaining rose bushes. I haven't tried it yet because we don't drink coffee. 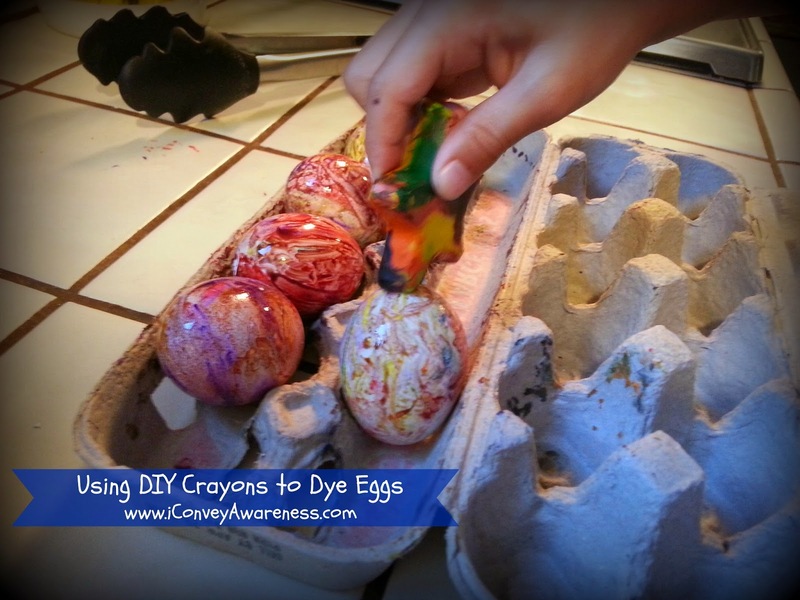 And, if you'd like to see some other ways to use egg shells, try this link. That's it! 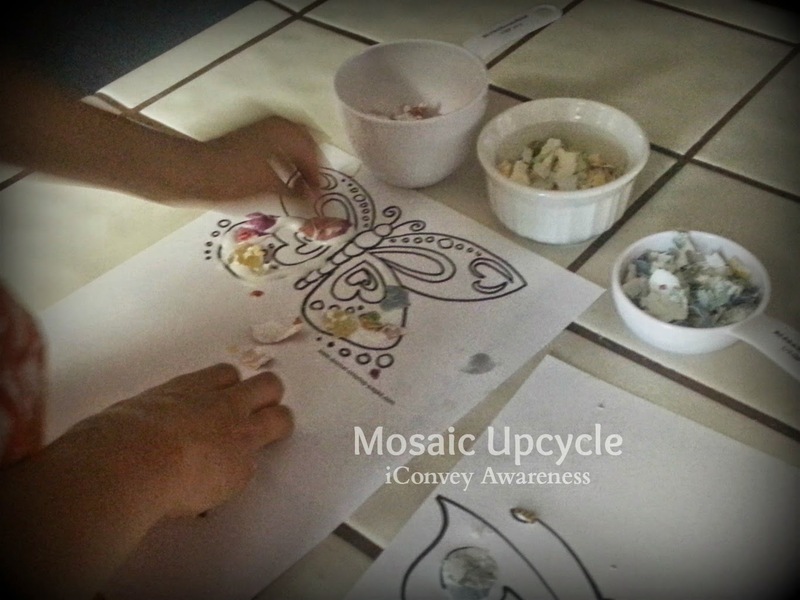 Of course, throughout the month we do other unschooling activities and many of them compliment what he's learning in school at the Montessori program. If you homeschool or unschool, what activities did you do this April? Link them in your comments. I'd like to pin them to my boards: Homeschooling, Sensory Boxes, Montessori, or Inspiring the love of learning. Thanks for stopping by, commenting, and pinning! =) Your blog hops are a lot of fun. I find great content weekly! 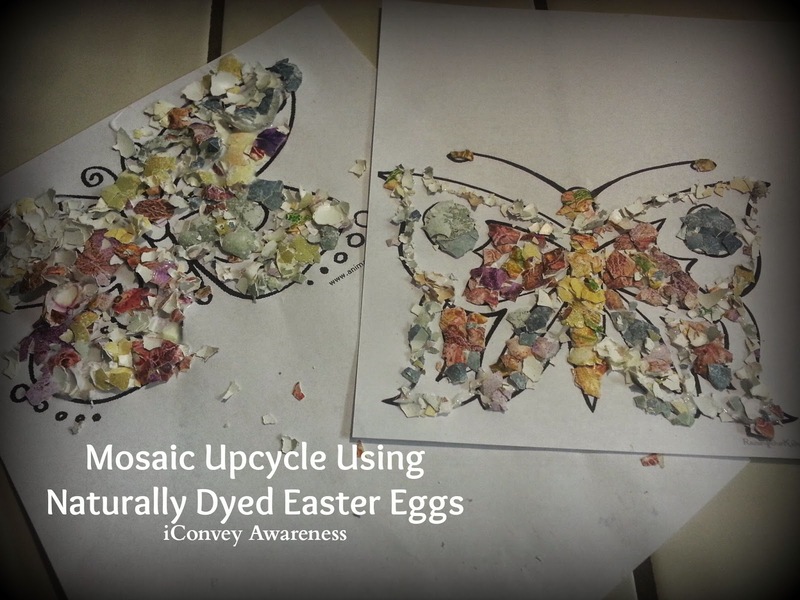 I really the recycled egg mosaic...really different and creative. Thanks for sharing some of your teaching tips on Merry Monday.